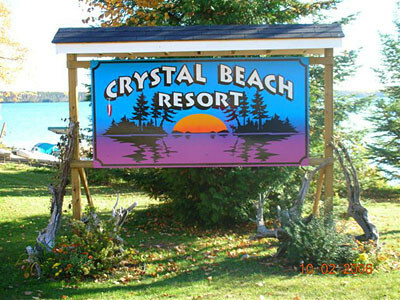 Crystal Beach Resort is a drive-in fishing camp located less than 2 hours drive from the Canadian/US border – just 15 minutes east of Atikokan, Ontario. Northern Ontario offers some of the most pristine and undisturbed freshwater fishing lakes that can be found anywhere. Our guests enjoy fishing on their choice of about 20 different local area lakes for lake trout, small mouth bass, northern pike, and walleye. Choose from remote, portage in lakes with a canoe, or bring an 18 foot boat and enjoy some excellent trout and bass fishing within site of your cabin. Opportunities abound in our area to fit whatever style of fishing you may prefer. Our modern cabins are all lakeside and lake view, and come fully furnished. We specialize as a housekeeping style only camp, and are very flexible with our booking schedule to accommodate most anyone’s busy work schedule. Please feel free to contact us with any questions of concern.